To clean your drinking water at home you have a lot of options. Which one is right for you? It depends, the most important one being the water quality problem you want to address. Below you find a list of water treatment techniques suitable to use at home. Follow the links to find out how these water purification methods work and read about their advantages and limitations. Activated carbon is charcoal treated with oxygen. The result is highly porous material, able able adsorb contaminants in it's tiny holes. Carbon can chemically attract certain contaminants and while the water flows through the AC filter. Passing contaminants are caught in the small pores of the material. This works best for organic (carbon-based) chemicals. AC filters are unable to remove salt, minerals or dissolved inorganic compounds. Activated carbon cartridges must be replaced regularly. If you fail to do so you risk that high amounts of earlier adsorbed contaminants will be released into your water. It is advised to monitor activated carbon filters. When buying an AC filter system consider the cost for replacement cartridges. AC filters work best with low flow rates. The longer the water is in contact with the carbon the better it can remove contaminants. AC filter vary by particle size they can adsorb. Some filters removes particles as small as 1 micron while the average filter can remove 5 micron particles. Activated Carbon Filtration is often used as a pre-filter or post-filter for reverse osmosis (RO) systems. Pitcher water filters as well as in faucet mount filters use this filter type as well. You also find it in counter top filter systems. Distillation is a process of purification and separation of liquid substances through evaporation and subsequent re-liquefying. A distillation filter systems bring water to its boiling point and collects the water vapor when it condenses. For home use small systems suitable to treat one gallon at a time are available. Larger systems mainly for industrial use are also common. Because salts are removed from the water by the distillation process the water might taste bland. Boiling water requires a lot of energy resulting in a significant higher electricity bill. Some pesticides have a lower boiling point than water. They vaporize and condense with the water. As a result they are still in the water after distillation. The distiller must be cleaned regularly from sediment and scale buildup. Ion exchange water softening works by exchanging the hardness causing calcium and magnesium ions in the water with sodium or potassium ions. This usually takes place in a filter cartridge filled with highly porous beads, the ion exchange resin. This resin needs regular recharging to be able to keep softening the water as sooner or later all available sodium or potassium ions are gone. This is done by flushing the resin with a solution of either of potassium chloride or sodium chloride. 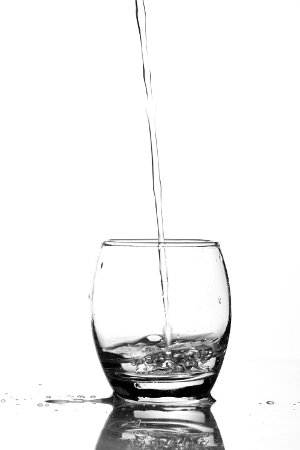 The water after filtering contains sodium and might not be suitable for persons on a sodium-restricted diet. Please get your doctor's advice on this issue. Regeneration might also be done with the more expensive potassium chloride instead of sodium chloride. This will not be an option for people with impaired kidney function. They should consult a doctor about this issue as it can cause heart problems. The idea behind Reverse Osmosis (RO) is quite simple but as a technique to clean water it was only developed about 40 years ago. The natural tendency of water (and other solvents) to level the saline concentration of two solutions that are just separated by a semipermeable membrane, is called Osmosis. Water migrates from the weaker concentrated solution to the stronger one until both solutions have the same saline concentration. In Reverse Osmosis water is forced by pressure to migrate just the other way around - from the stronger solution to the weaker one passing a semi-permeable membrane that allows the smaller water molecules to pass but blocks the bigger saline molecules. As a side effect, other contaminants with molecule sizes bigger than water also can not pass this membrane. Reverse Osmosis is not a water filtering process that should be used as only water cleaning step as it is ineffective against everything smaller in size than the water molecules like chlorine and volatile organic chemicals (VOCs). RO is the ideal treatment if you rely on sea water for drinking as is removes salt completely. Removes salt, lead, manganese, iron, and calcium and other contaminants from the water depending on the membrane used. Might be helpful for people on a sodium-restricted diet as it will remove sodium along with many other impurities which may be present. Please get your doctor's advice on this issue. Residential Reverse Osmosis systems work with relatively low pressure and produce a lot of waste water. The lower the pressure the more water needs to enter the system to produce 1 liter of clean water. For average RO home systems 75 to 95 percent of the water is lost for drinking purposes. RO removes also the healthy minerals from the water. The water becomes acidic as a result of the removal of salt from the water. It's pH-level should be adjusted before consumption. This is important as it can not only effect your body directly but acidic water also may damage pipes and fixtures. This later may result in leaking i.e. toxic chemicals from these sources. Considering the installation and maintaining costs, the huge amount of water wasted simply render it not feasible. Only in very few, very special cases this might be a good option. Most house owners who want a whole house water filter system should look for a different system. Short wavelength ultraviolet (UV) light can be used to kill microorganisms. Ultraviolet germicidal irradiation (UVGI) is used i.e. for food, air or water disinfection. The radiation destroys the nucleic acids of the microorganisms. With a damaged DNA, vital cellular functions are no longer possible and they die. How effective this process is to disinfect water depends on the length of time of exposure, wavelength and the amount of particles in the water. There are also some micro-organisms who can survive exposure to UV better than others. UVGI works best in combination with a reverse osmosis system. If not used for clear water a pre-filter to remove larger particles is advisable. Was it helpful? Please rate! Counter top filters – Should you buy the Aquasana, Home Master or New Wave Enviro? WaterFiltersHQ is a participant in the Amazon Services LLC Associates Program, an affiliate advertising program designed to provide a means for sites to earn advertising fees by advertising and linking to amazon.com. We also link to other sites where we might receive a commission if a customer buys from them.